Editor's note: From Maundy Thursday to Easter Sunday, Florida Conference churches found creative ways to mark the events leading up to the Resurrection. Click here to see more coverage. TAMPA -- Some onlookers gawked. Others took photos with their iPhones. Still others looked on with respect, as a group of men and women dressed in period costumes took on their roles in a Good Friday re-enactment at noon in downtown Tampa. 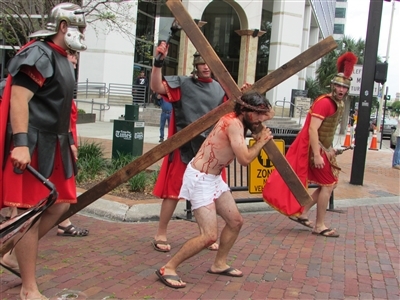 Joe Stevens of First UMC, Lutz, portrays Jesus staggering under the cross in the congregation's annual Good Friday re-enactment in downtown Tampa. Photo by B.C. Manion. The dramatization was intense, as Joe Stevens, assuming the role of Jesus, was led by guards down Kennedy Boulevard to the steps of Tampa City Hall. People in the crowd jeered and ridiculed Jesus, as Roman guards flogged him, then forced him to wear a crown of thorns. Next, Jesus took up his cross and was led by the soldiers in a procession across Kennedy Boulevard and around Lykes Gaslight Park. As he carried the cross, a crowd of volunteers in period garb followed him – some berating the so-called “king” and others proclaiming his innocence. The procession ended in the park, where the bloodied Jesus was hoisted onto a cross, flanked by two other crosses. As he hung there, he uttered his final words and died. As Jesus was being lowered from the cross, Rev. Rick Cabot, senior pastor of First UMC, Lutz, reminded the crowd that Good Friday was just part of the story. “This is just a rag-tag group of volunteers trying to remind Tampa Bay about the love of God. God sent his only begotten son to die for the sinners of the world – that’s you and that’s me,” Cabot said. “He loves each and every one of you. He wants to help carry your burdens, your pains and your struggles. The re-enactment of the crucifixion, a downtown tradition for 28 years, gives people a chance to get a glimpse of the Gospel, Cabot said. Church member Rob Wolf was there with a cart filled with goody bags to dole out to the homeless. 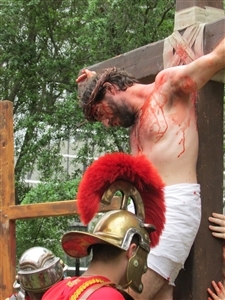 Jesus, portrayed by Joe Stevens of First UMC, Lutz, suffers on the cross in a scene re-enacted in a downtown Tampa park. Photo by B.C. Manion. Wolf thinks the Good Friday re-enactment has value. “It really sends a message out about the importance of Easter,” he said. John Lockhart, who played the role of Simon of Cyrene, was forced by the guards to carry the cross for Jesus. Lockhart said the re-enactment may not cause any conversions, but it may prompt some people to reflect upon the message it conveys. Clarence Sampson, security guard for BB&T Bank, was there to watch – just like he is every year. “It is truly a blessing. The message is clear and understandable. It makes you want to basically get your life right,” Sampson said. Soraya Monzote of Dade City and her 8-year-old son, Steven Ellison, just happened to be in the area when the drama played out. It prompted her son to ask lots of questions that she was able to answer, she said. Sixteen-year-old Matt Houldsworth, who donned a tunic and cape to play one of the guards, said it was his third year of being involved. He’s noticed a range of reactions from observers. “Sometimes you’ll see people crying. Sometimes you’ll see people laughing at us,” he said. “If it helps one person, it’s worth it,” Houldsworth said.